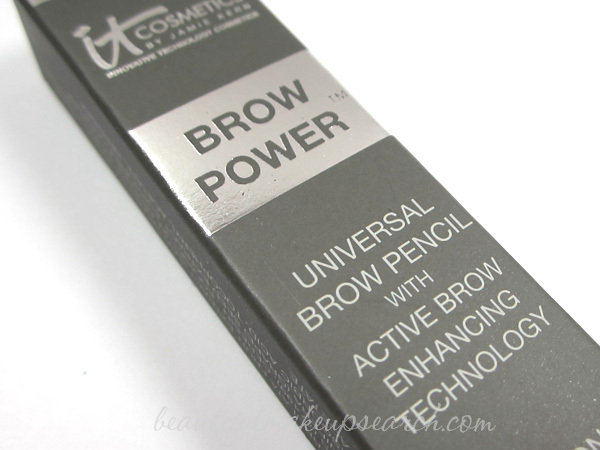 It Cosmetics Brow Power Universal Brow Pencil Review & Photos. If you ever watch any of the QVC beauty shows like I do, I am sure you have seen some of the It Cosmetics line. In case you haven't heard of them, It Cosmetics stands for Innovative Technology Cosmetics. All of the products are created with the help of leading plastic surgeons to infuse medical grade makeup with healing skin loving ingredients and cutting edge technology. After using the It Cosmetics Brow Power Universal Eyebrow Pencil for some time (remember it was one of my QVC beauty favorites?) I knew I had to test more. So far, I am really impressed and will be bringing you some more reviews on the products I am testing shortly. In the mean time, let's take a look at my favorite brow pencil. The universal shade makes this pencil just about perfect for everyone. It blends into my brows effortlessly while it defines and fills them in. The strokes are defined enough where they even look like fine hairs, again, making it blend perfectly into brows making them look totally natural, but better. I like to fill in my brows with a very fine movement and then brush them with the spooly brush to make them look as natural as possible. The color lasts all throughout the day, so you never have to worry about your brows fading as the day goes on. Shop online at itcosmetics.com or other online beauty retailers such as QVC and beauty.com.